Young children have a basic understanding of emotions and desires. For example, 2-year-olds understand that people who get what they want feel happy, and that people who don't will feel sad and might persist in trying to change the outcome (Wellman & Woolley, 1990). Preschool-age children also have a basic understanding of rights and wrongs. They know, for example, that moral violations - such as hitting or stealing - are wrong, even in places where there may be no formal rules in place to govern such behaviors (Nucci, 2001; Smetana, 1981). In the current study, our goal was to add to this area of research by asking 3-9-year-old children about the emotions that stem from satisfying two types of desires: material desires, and wicked desires. In the Material Desire story, participants saw a child who wanted to use a playground swing. The child pushed someone else off the swing, and then used it himself. Thus, a material desire (wanting the swing) was satisfied by causing harm to another person. In the Wicked Desire story, participants saw a child who simply wanted to push another person to the ground, and did so successfully. Thus, a wicked desire (hurting someone) was satisfied. Our results show that 3-year-olds reason quite differently about the satisfaction of material and wicked desires. Three-year-olds predicted that happiness would stem from material-desire satisfaction. This tendency declined as children got older, with the oldest children more often predicting that the aggressor in the Material Desire story would feel guilty. However, when asked to predict the emotions that stem from satisfying a wicked desire, the 3-year-olds tended to attribute the negative emotions, while 4- to 5-year-olds were more inclined to attribute positive emotions. Why did the 3-year-olds predict that positive emotions would stem from a material-desire transgression, and negative emotions would stem from a wicked-desire transgression? The answer is probably not simple. One answer may lie in young children's difficulty understanding that people can harbor wicked desires. Research has shown that preschool-age children are inclined to ignore negative information about people, making positive judgments about personality even when they have reason to think the worst (e.g., Boseovski & Lee, 2006). This has been called the 'positivity bias,' and it tends to fade by middle childhood. It may be that a lack of insight into wickedness or evil prevented the 3-year-olds from understanding that a person might feel good about hurting someone else for no clear reason. At the Hands-On Museum in Ann Arbor, Michigan, we are currently running a study to explore what children understand about evil and wickedness. Children are shown familiar (e.g., Captain Hook, Ursula) and novel villains, and asked to make predictions about what these characters might do or feel in situations that assess: willingness to take violent revenge, desire to aggress without provocation, use of aggression to obtain resources, capacity to feel guilt, willingness to help and share with others, etc. This is the first study that systematically assesses what children understand about the nature of wickedness. For more information about this research, contact Craig Smith, Living Laboratory collaboratornow at the University of Michigan. When people do something “wrong” they may have many different motives. 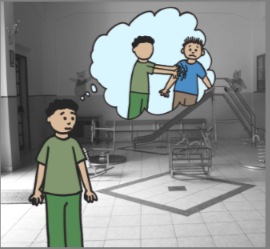 Imagine some different situations when a child could be caught doing something wrong (like taking a toy from someone else, pushing someone, or lying), and think of some reasons why the child might do it. Do some of the reasons make them seem “bad”? Do other motives make their actions justified or acceptable? Ask your children what they think – is it ever ok to take something from someone? Does it make you “bad” or “wicked”? How would they feel in each situation?